I just finished reading Marcella Hazan's recently released autobiography, "Amacord". We all know Marcella Hazan as the Queen of Italian cooking but when she and her husband, Victor, first moved to the United States, she wasn't much of a cook. As a newlywed in a foreign country, she poured her efforts into learning how to cook so that Victor, who came home for lunch every day from work, would be pleased. Needless to say, over the years she became quite a cook. She started giving small cooking classes out of her apartment and one day she received a call from a reporter at the New York Times. She didn't know who he was. He wanted to come over and interview her, but the times he suggested were always in the middle of the day when Victor came home for lunch, so she just invited the reporter over for lunch one day. The reporter was Craig Claiborne and the lunch Marcella served knocked his socks off. This was back in 1970 and her authentic Italian cooking was anything but the usual spaghetti and meatball fare everyone knew at that time as Italian cuisine. She served a lunch of Roman style artichokes, tortelloni stuffed with swiss chard, prosciutto and ricotta, veal rolls stuffed with parmesan and pancetta, fennel salad and a dessert of marinated orange slices. To this day, she said she doesn't think she could improve on that lunch. It was classic. 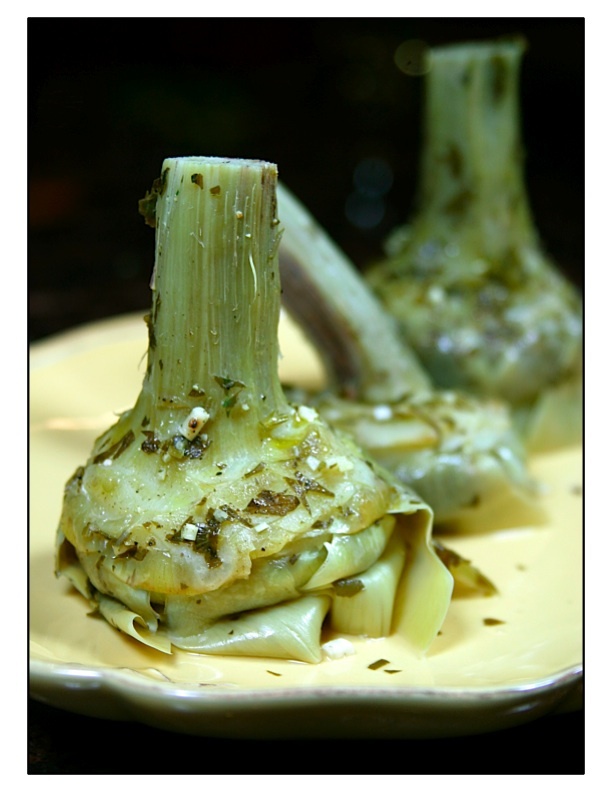 These traditional artichokes that Marcella served are common in Rome. Instead of cooking the whole artichoke and biting the flesh off the leaves, the artichokes are trimmed of everything inedible and cooked in herbs and garlic. They are delicious and you can eat the whole thing. They are a little effort up front to trim them, but they are well worth it. for a printer friendly recipe, click here. Bend back and snap off tough outer leaves from artichokes, pulling off enough leaves until you expose the central part of the artichoke with whiter leaves at the base. 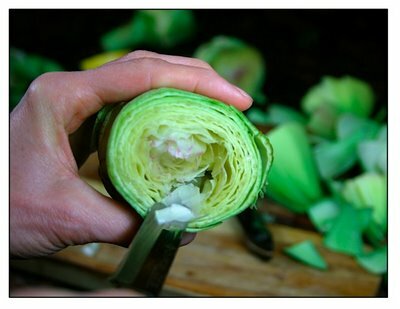 Slice off tops and then squeeze some lemon juice over the cut parts, so they don't turn so brown. 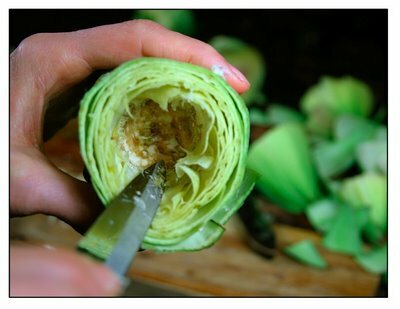 Trim the sides of the artichokes of any tough green parts. 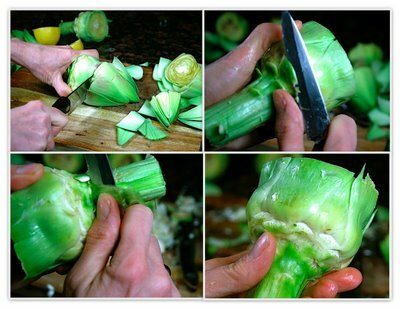 Trim the end off stem and then, using the knife, trim the tough green outer part of the stem. Rub with lemon. In a bowl, combine the parsley, mint, garlic and salt and pepper. Rub the mixture into the artichokes and over the outsides of the artichokes. 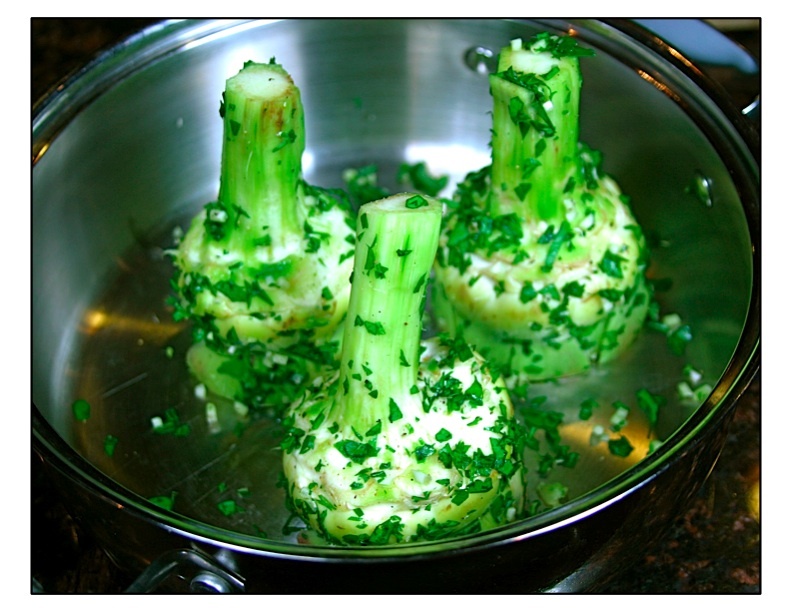 Set the artichokes, topside down with stems facing up, into a pot with a lid. Add oil and enough water to come one third up the sides of the leaves (not the stems). Cook over medium heat until artichokes are tender, 35 to 40 minutes. 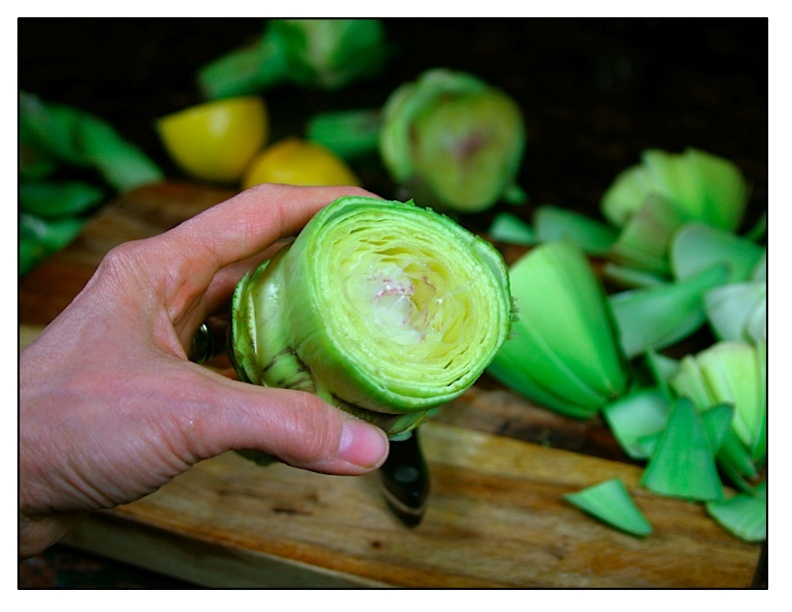 Transfer artichokes, stems up, to a serving platter, reserving juices. . Let cool to warm or room temperature. To serve, drizzle the pan juices over artichokes. Yes. This is wonderful. It's the recipe I use. Isn't the mint lovely? And they are really delicious at room temp. I always enjoy your step by step photo's! I hope you do many more in 2009! I will never pass up an artichoke, my absolute favorite! This looks divine!! The artichokes look incredible, and those step-by-step pictures are so helpful. Love the post! I love Marcella Hazan; I have her "bible," The Art of Italian Cooking. Her son has a wonderful deli in Sarasota, near where I have a second home. I adore artichokes; mint, not so much, but I'm game to try them. You've done a wonderful tutorial. I adore artichokes, and you've got me craving some now right now. They look lovely. i love the idea of using mint in this dish. this is going on a to-do list for the springtime! beautiful. My children love artichokes, I will certainly try this recipe. Thanks for sharing! I think Hazan is the only person to repeat what my mom told me 60 years ago....if you blend (in a blender) raw onion to a paste, there will be bitterness. A little hot water first. beautiful! and thanks for the step by step. Happy New Year! 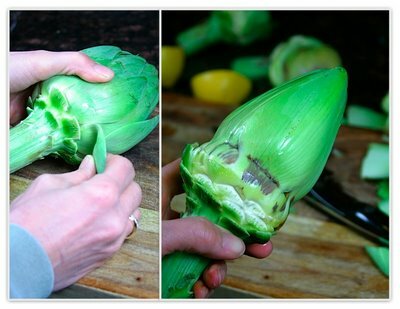 Thats such a lovely step by step process!...never tried artichokes..but your dish sure looks tempting! This is one of my favorites and served everywhere in Rome, its about time i made it. I think you would love the local market in Testaccio, Rome - artichoke heaven and the most wonderful wild mint from ostia which works so beautifully in this recipe. The only thing I do differently is leave them to brown in the oil after the water has evaporated so the bottoms caramelize and sweeten; it makes them a little closer to the deep-fried carciofi alla giudia and so very good. 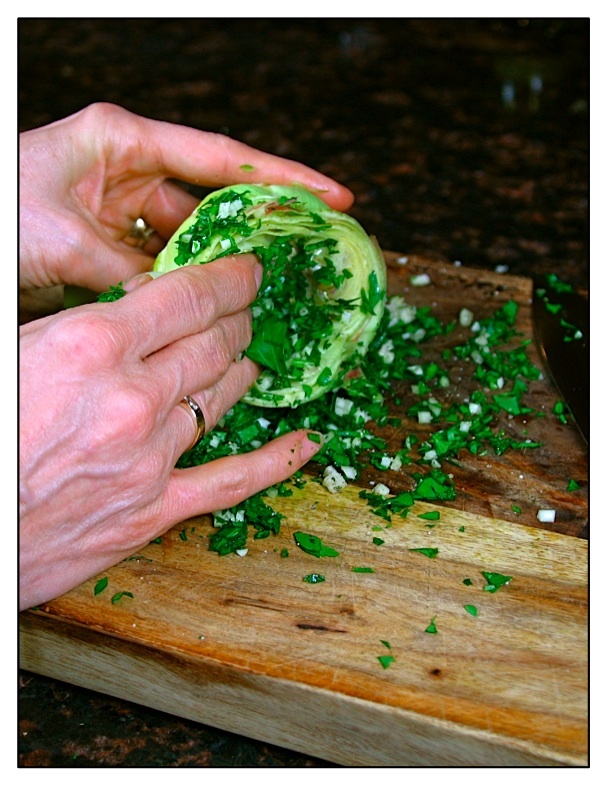 Wonderfully written article on two of my favorite subjects -artichokes and Marcella Hazan! They helped me discover your blog and it's one of the best I've seen. Clearly written, but with passion. Clear photographs. thanks so much for the wonderful photo tutorial! my husband made this for us last night, and said he could not have done it without your photos - taking apart an artichoke is truly an art. These were territic. I cooked off the water at the end, allowed to carmeize a ittle and grated fresh pecorino over them...wow. a hit at my house.